Understanding that the spectrum of gin is constantly evolving, with a new generation of distillers, varying botanical blends and creative base spirits, most of us avid drinkers are receptive to tasting new flavours and categories. In the simplest flavour breakdown, genever is a gorgeous cross between the botanical and juniper distinguishing characteristics of gin and the varying grain bills of the whisky world. The main differentiation between a gin and its ancestor genever is the presence of Moutwijn, a malt wine distilled from rye, corn, wheat or barley malt. Genever retains much more of the flavour of its fermented grains than its neutral based counterpart, making the character, distillation and grain breakdown of the malt wine as significant as it is in whisky and thus the distinguishing backbone of a stand out genever. The two general categories of genever, oude and jonge refer to the percentage of malt wine present in each style, the oude requiring at least 15 per cent often with upwards of 50-70 per cent presence and jonge style requiring under 15 per cent malt wine presence. The remaining percentages are blended with a juniper and botanical infused neutral based spirit, though unlike gin, the juniper does not have to be the dominant flavour profile. Currently there is revival in production of 100 per cent malt wine genever as demand from bars and cocktail recipes grow. Most recently the deliberate launch of Old Duff single malt genever and Bols 100 percent malt genever in targeted US markets exemplifies the increase in demand for malt wine in the cocktail culture. Popular in the 19th century, many classic cocktails, familiar today, call for Genever. Genever is a wildly expressive spirit and embodies a range of character that adds excitement to any cocktail. Although historically in Belgium and the Netherlands it was and still is slurped neat, from the early 19th century cocktail revival, most of popular cocktail recipes and influential bartenders, most notably Jerry Thomas, called for genever in their most famous concoctions, until Prohibition killed access to the popular spirit. Most cocktails that utilise citrus, like the Tom Collins or Last Word can be enhanced with the malty botanical flavours of genever and transform your ordinary cocktail into an experience. 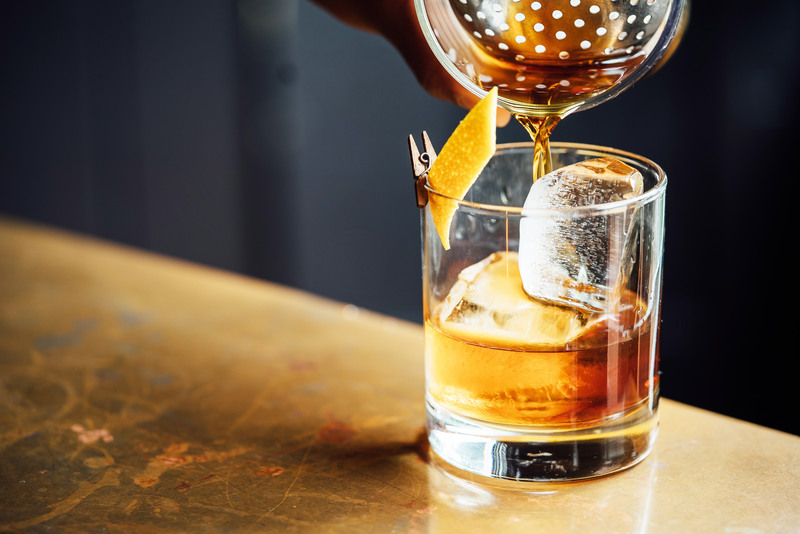 On another spectrum, using oude genever instead of whisky in an Old Fashioned or Manhattan creates a lighter bodied cocktail with waves of botanical forward flavours. Here are classic cocktail recipes with a genever twist. Walk into a classic saloon in the French Quarters, New Orleans or a take a walk down the bar-lined canals in the Netherlands, you might find a strange tradition taking place. Hands folded behind their backs, bent over the bar, slurping the head off an overflowing tulip glass and you will have experienced the quirky drinking habits of the Dutch community. Enveloped in the saying “going Dutch” the culture is known for being a bit stingy or perhaps mindful of their portions, the tradition was to make sure the barkeep poured the full pour to their patrons filling the glass to the brink of overflow. Patrons, not wanting to spill even a drop of the malty goodness would “slurp” the head off their glass to reduce spillage. Similar to a “boilermaker” the “Kopstootje” shot of genever is followed by a beer back usually white ale or lager. Genevers that can be found in the UK or USA, and online at Masters of Malt, Whiskey Exchange or K&L Wines. Passion project of spirits guru, Philip Duff, Old Duff genever is created for bartenders, the cocktail industry and for genever enthusiasts. Without a doubt Philip can always be found with a flask of Old Duff single malt tucked away in the folds of his dapper attire, ready and willing to share a taste of his oude style genever with the world. The original Old Duff genever contains 53 per cent malt wine and blended with grain distillate and botanicals. Old Duff genever is distilled at the Herman Jansen Distillery in Schiedam, Holland and intentionally boasts a rye and barley heavy malt wine presence and bears a viscous mouthfeel rich with rye, warm spice and an overall bready goodness. the gorgeous Bachte-Maria-Leerne, just outside of Ghent. Toasted rye, warm nutmeg and pepper spice, Filliers’ 8 Years Oude genever has heavier malt wine presence, toasted rye, warm nutmeg and pepper spice on the palate and the mellowed malt from the American oak creates a perfectly sippable treat. Filliers’ boasts some of the oldest aged genever safely hidden in the depths of their cellars including commercially available 12 years old, 17 years old and 21 years old genever. We had the pleasure of meeting Emile Fillier when the brand launched their gin in the United States and learned how expansive the legacy of Filliers’ has been in the growth of the genever category since the late 1700s. One of the smaller distilleries in the Netherlands is run by a powerful female distiller, the talented Myriam Hendrickx. Myriam carries the knowledge passed to her by the seven previous generations of distillers that came before her and was tapped to take over the production after the last of the Rutte family passed. The distillery protects the old recipes, most notably, the original Old Simon genever distilled with a 40 per cent malt wine and distilled with charred hazelnuts and walnuts and steeped berries from the Dutch coast. Rutte also produces a rarer Koornwyn jenever, their blend of varying malt wines with juniper and finished in oak. Ketel 1, pronounced Ketel-ing, is pleasant for genever enthusiasts as well as those new to the category. Light bodied, juicy malt wine profile with an agreeable level of sweetness and a smooth finish, this jonge style genever is rested in French oak casks for 12 months and distilled with two handfuls of unique botanicals. This year, we were invited to a tour of the Nolet’s Distillery and discovered that the distillery still employs the original Ketel 1, the oldest pot still in use today built around 1864 and continues to utilise coal fired heating. The legacy of Nolet’s Distillery dates back to the late 1600s genever distillery established by Joannes Nolet and continues with the Carlous Nolet and sons rejuvenating the brand since 1977. Distilled at Stokerij De Moor in Aalst, Belgium by master distiller Patrick Van Schandevijl, the distillery overcame a long history of wars that threatened to destroy the founder Frans De Moor’s dream of bringing genever to the Belgium people. This tiny distillery makes its own distinct malt wine, creating a variation of genever for the Belgium people and now the US under the brand name Diep 9. Proprietor Veronique Beittel may very well be the foremost expert on Belgian genever, her publication Genever: 500 years in a bottle is a perfectly concise history and evolution of the spirit. Distilled in 52 gallon micro batches, Diep 9 aged oude genever consists of a 40 per cent malt wine blend of barley, rye and wheat and aged for two years in French oak barrels. A smooth bouquet of floral, earthy and light spice, Diep 9 genever coats your tongue and finishes with the flavour remnants of a sherry barrel. One of the oldest distilleries in the world continues the tradition of Moutwijn spirits since 1575. Bols master distiller, Piet van Leijenhorst is one of the most intriguing characters with a cellar full of ageing genever and a passion for malt spirits that continues to invigorate the popularity of this forgotten spirit. The original 1820 Bols genever crystal clear appearance is deceptively misleading, as it stands confident with a full-bodied fruity malt palate and a depth that cannot be ignored. Bols Barrel Aged Genever is a bit mellower in flavour as it has rested over two years in French oak enhancing the palate with caramelised edges and warm spice notes. Natasha Bahrami aka the Gin Girl is the owner of The Gin Room, a gin centric bar in Saint Louis, MO. She dedicates her focus to teaching and creating robust education platforms through Ginworld, a company created to help elevate the category. Natasha continues her work judging spirits for competitions globally. Substituting malt wine is often a tasty alternative in a rye or bourbon whiskey cocktail. The use of genever fosters a lighter bodied mouthfeel with a refined botanical presence while retaining the malt presence of a whisky. Mouthfeel for the win, in this indulgent cocktail. The herbal notes of the Chartreuse are a perfect accompaniment to an aged oude genever while the refreshing lime balances out the heavier components to make a knockout cocktail. Sure to impress. Adding a jonge style genever to a cocktail known as a summer sipper can transform it into a year-round beverage. Muddled blackberries and citrus combined with the fruit forward malt and spice botanicals impart a rounded complexity of flavour. Originally developed with genever in mind, this classic cocktail openly begs for the malty grain presence of an oude genever over an old tom gin, as it adds the bit of cereal sweetness and substantially bolder body. The original boilermaker, this ever so social tradition engages friends much more than a simple beer and a shot. Put your hands behind your back, line up side by side and be prepared to loudly slurp your malt wine! A predecessor to the Tom Collins, the John Collins or Dutch Collins utilises genever, clinging to the citrus creating a malty body and lingering nutty flavour to add a wow effect to this cocktail recipe.